The whole of life is about oppositions. Day and night, summer and winter, life and death, masculine and feminine. Yet as humans we invariably refuse to accept this natural law and pin all our hopes on one end of the universal stick, only to get severely beaten by the other end. The more we insist that one of these polarities is good and right, and try and suppress the other one, the stronger the pendulum must swing back the other way. This truth particularly applies to opposition aspects in our own charts. We inevitably try to identify with one end of it particularly in the way we present ourselves to the world. This desperate attempt to focus on one end of the seesaw is even stronger if that end contains our Sun. But if that is so clearly the case for us, what about other people who also have oppositions. What we see is only half of the story, and in the case of some charts that other half is very sinister in deed. Harold Shipman was a British doctor and one of the most prolific serial killers in history. He was found guilty of 15 murders, sentenced to life imprisonment and the judge recommended that he never be released. There was a striking similarity in Shipman’s choice of victims, and the manner of their death. They were mostly elderly women who lived alone. They were in good health for their age, until he injected them with lethal doses of Diamorphine, the medical term for heroin. After his trial, The Shipman Inquiry was an investigation into all deaths certified by Shipman. In its final report, it concluded the probable number of victims was 250. Much of Britain’s legal structure concerning health care and medicine was reviewed and modified as a direct and indirect result of Shipman’s crimes. The most staggering thing about Shipman’s life was not so much the murdering but how he managed to get away with it for 23 years. He killed 250 people without anyone suspecting anything. This is the problem with oppositions, what you often see is not what you actually get. Capricorn Research has a collection of 387 charts of Medics and the most common Sun signs are Gemini and Capricorn with 133 and 130 % of the expected scores respectively. Shipman has the Sun in Capricorn and the Moon in Gemini so fits this classical picture perfectly. The combination of natural authority ( Sun Capricorn ) with friendly communicative demeanour ( Moon Gemini ) makes for the perfect local GP. Shipman’s Sun / Venus conjunction creates a rather benign feel about the authority figure. He might be dishing out sour tasting medicine but you know he is doing it for your own good. That is one end of the opposition, the part of Shipman that he was keen to show the world. The other end was a very close Mars / Saturn conjunction in Cancer. Mars and Saturn are opposites. Mars is assertion, movement, and aggression, Saturn is restriction, limitation, and obstruction. The two planets do not sit well together, aspects between them usually create high levels of frustration, particularly sexually and the results can be long periods of suppression coupled with sporadic outburst of violent behaviour. This conjunction being in Cancer, the expression of this would be very covert and indirect. Cancer is the sign of the family and particularly the mother. Saturn is the planet of old age, so it is easy to see Saturn in Cancer representing old women. Saturn is conjunct Mars so Shipman spends his spare time bumping off grannies. The mystery is why did he do it ? He has never acknowledged the truth of his crimes, apparently even to himself. In the trial the Crown said he had clearly enjoyed exercising the power over life and death, but although Shipman’s known victims were women, there was no suggestion in court of any sexual element in the killings. And according to the psychiatrist, the motive for the murders lies in some deep-seated personal need. The opposition in his chart focuses onto a T Square apex Jupiter in Libra. This is not really what would be expected of the biggest mass murderer in history but it can give us some insight into his attitude to his killing and the way he did it. It may be symbolic that the instrument of death chosen by Shipman was a hypodermic syringe. Giving injections was part of his professional life, and he took pride in his reputation ( Jupiter ). His method of taking away life was painless for the victims, Some of them were found in an attitude of repose, almost as if he had taken care to end their lives in a peaceful manner ( Jupiter in Libra ). Shipman seemed to think that he knew when a patient ought to die ( Jupiter ) and that he was providing them with a release. His final victim was Kathleen Grundy, a former Mayor of Hyde. Grundy’s daughter became concerned when informed that a will had been made that excluded her but left £ 386,000 to Shipman. The killer was arrested when he was found to own a typewriter of the type used to forge the will. This final episode is particularly symbolic of an apex Jupiter as he would have to stood to gain considerably in a financial way through a will, which as a legal document is ruled by Libra. It is always a bit annoying to not have the times of birth available for every person in existence, but its rather splendid how often the Universe takes this lack of information into account and produces a noon chart that does extremely well under the circumstances. The more Capricorn Research works with Astrology, the more its clear that the Universe is spelling out its own truths and great big bold block capitals and the more bizarre it is that the vast majority of people just don’t see it. 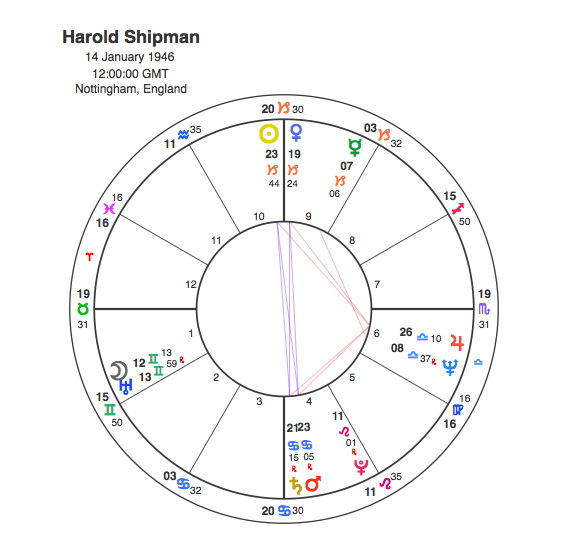 Shipman’s noon chart reinforces the Capricorn / Cancer opposition theme because it places it in the 10th and 4th houses, emphasising the dichotomy between his standing in the community ( 10th house ) and his killing of old people many of whom in their own homes ( 4th house ). Capricorn Research doesn’t normally publish rectified charts as it lends a somewhat unscientific factor to the proceedings, but is quite content to adjust the charts of gruesome murderers in private. This has been pointed out as a rather sad way of spending one’s time but someone’s got to do it, so it might as well be someone with the Moon in Capricorn. So many astrology websites are conducted by ethereal beings with their lights in Libra or Pisces and their focus mostly on the love lives of characters like Cheryl Cole. Capricorn Research is prepared to look at the darker side of life, so that they don’t have to. And it would work so well if Harold Shipman had been born around 3.30 in the morning. This time gives Shipman Scorpio rising which makes him far more able to maintain this dark secret existence than the noon chart Taurus. It also gives him a ruthless ability to manipulate the very lives of other people. But the most significant factor is that it put the Mars / Saturn conjunction into the 8th house of death. 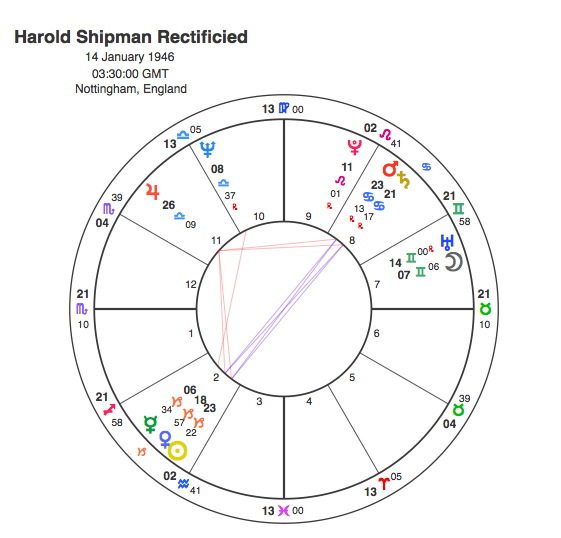 In a chart like Shipman’s its virtually inconceivable that the 8th house would not be heavily tenanted and this seems the most appropriate chart available on the day. The other aspect of this shift in time is that it also makes a 5 degree difference in the position of the Moon. Granted this takes the Moon further away from a close conjunction with Uranus in Gemini, thus reducing the eccentricity slightly but it does have a powerful impact on the transits that marked seriously important stages in his life. Many people have pointed to a traumatic event early in Shipman’s life, the death of his mother from lung cancer in 1961, a particularly painful illness, when he was still a teenager, as having had an powerful impact on the development of his personality. This event would certainly have been characterised by a Pluto / Moon transit. The noon chart shows this event to have occurred between 1963 and 64. The rectified chart places Pluto square the Moon in 1961. Shipman was arrested in 1998. The noon chart gives Pluto opposite his Moon in 2000, the rectified chart makes this aspect happen in 1998. For either chart, Shipman’s killing spree began in 1975 as Pluto made its first contact to his Capricorn group of planets, square to Mercury in 1975. Exact details are scarce, but Capricorn Research believes the critical turning point to have occurred between 1979 and 82 when Pluto was transiting the T Square, in square to his Sun / Venus and Mars / Saturn. Harold Shipman is the only British doctor who has been found guilty of murdering his patients but there was one other who was brought to trial for similar offences but no successful prosecution was made. The similarities in the charts are quite incredible despite the fact that Adams was born nearly half a century earlier. Adams has the Moon in Gemini opposite Uranus, Shipman has the Moon in Gemini conjunct Uranus. In 35 years of looking at charts, Capricorn Research has never seen two with this degree of similarity. Adams has a further double opposition between a Venus / Saturn conjunction in Sagittarius and a Neptune / Pluto conjunction in Gemini. The extremely strange connections to do not stop there. 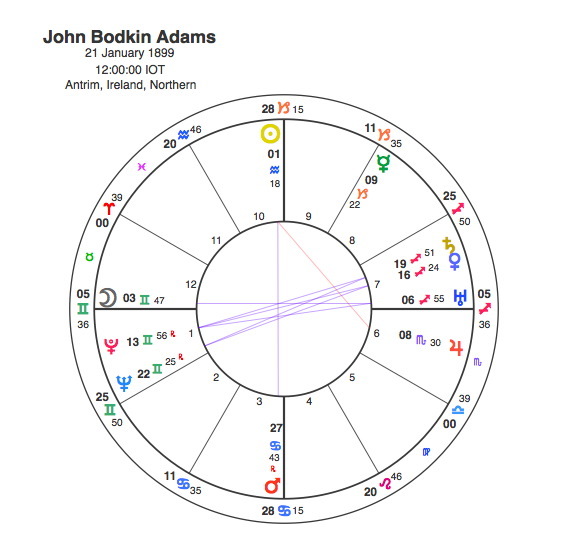 If we rectify Adams chart to the same time as Shipman’s, at 3.30 am we have the Sun in the 2nd house opposite Mars in Cancer in the 8th house of death and Scorpio rising. But incredibly the transiting Pluto is in aspect to Adams Moon when he was arrested in December 1956, just as it was for Shipman in 1998. It is again a bit difficult to tell with the timing of things but rumours began to surface about Adams in the mid 1930s as he began to inherit money in their wills. Pluto was opposite his Sun and conjunct Mars from 1936 to 1940. Another point about the rectified chart is that it brings Adams’ Moon and Neptune / Pluto opposition into the 7th house of relationships in opposition to his Venus / Saturn conjunction. This also seems an entirely appropriate placing as Adams was almost certainly gay. The police were given evidence about his relationship with the magistrate, Sir Roland Gwynne, a Mayor of Eastbourne but they ignored this line of inquiry (despite homosexual acts being an offence in 1956). This is a testament to Adams’s close connections to those of power in Eastbourne at the time. There were rumours of Adams having three “mistresses”, but these were probably just “covers” to avoid suspicion. Adams became engaged in around 1933 to Norah O’Hara but it was called off 2 years later. It was suggested that, apart from being homosexual, Adams also didn’t want his being married to interfere with his relationship with his elderly female patients. 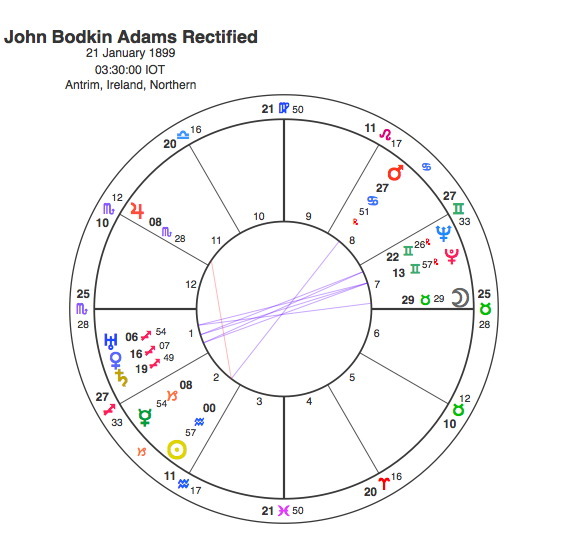 The similarities between Shipman and Adams charts are incredible, even to someone who is used to being continually amazed by this subject for 35 years. Fortunately such gruesome situations hardly ever arise and the changes that have been introduced in the NHS since Shipman’s case will probably stop it ever happening again. But in these days of patients choice and league tables, Capricorn Research is quite ready to publish his own on medics most likely to grab your granny.